Our beloved St. Thomas Armenian Church is dedicated to the holy memory of St. Thomas, one of the twelve Apostles of Christ. Thomas the Apostle was one of the Twelve Apostles of Jesus Christ, according to the New Testament. He is often referred to as doubting Thomas because he doubted Jesus’ resurrection when first told, (Gospel of John), followed later by his confession of faith, “My Lord and my God”, on seeing Jesus’ wounded body. 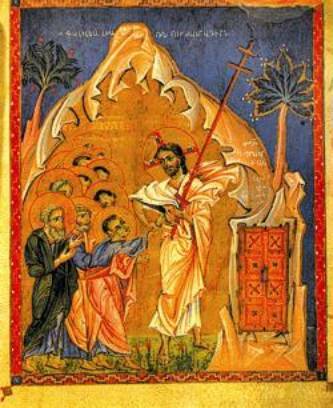 He would not believe in the Resurrection of Christ until he saw, on the hands and feet of Jesus, the marks of the Crucifixion. St. Thomas was also known as Didymus (which means “the twin”). He was a very courageous and dedicated Apostle of Christ. When the Pharisees and the members of Sanhedrin, the highest Jewish governing body, were plotting against Christ and planning for his murder in Jerusalem, Christ was told that Lazarus, his beloved friend and brother of Mary and Martha, was on his death bed; and if He did not hurry, Lazarus would die. Following the Pentecost (the descent of the Holy Spirit upon St. Mary, the Mother of God) the twelve Apostles, seventy-two disciples, the myrrh-bearing women, and his secret disciples in the Upper Room, and almost all the Apostles went to the four corners of the world to spread the “Good News,” the Gospel, and founded churches. St. Thomas is said to have traveled outside the Roman Empire to preach the Gospel. He went as far as India, where he was martyred on a hill which is now called “Mount of St. Thomas” near Madras. He founded the Church of the Christians of St. Thomas in Malabar, South India. According to tradition, the Apostle reached Muziris, India in AD 52 and baptized several people, founding what today are known as Saint Thomas Christians or Nasranis.